A very special and rare treat for electricjive readers today. It represents a holy grail amongst collectors of South African jazz and is spoken of in hushed tones. The problem with these "rare as hen's teeth" records is that not enough people have heard them! The record is Gideon Nxumalo's big band tribute to the great South African drummer Early Mabuza. It is also the first jazz album recorded by Rashid Vally on his Soultown label in early 1970. Before recording jazz Vally released dance bands like the El Ricas and the High Notes. After this foray into jazz Vally's partnership with Abdullah Ibrahim led to the establishment of the As-shams/Sun label and the albums Peace, With Kippie Moeketsi, Underground in Africa and then the big breakthrough Mannenberg. Early Mart is the last album Nxumalo made before passing away - aged 40 - on 24th December 1970. For more on Gideon "Mgibe" Nxumalo check out our earlier posting of the seminal "Jazz Fantasia" LP. "The sound is African, modern, avant garde." says Leslie Sehume, author of the recited poem on side 1. 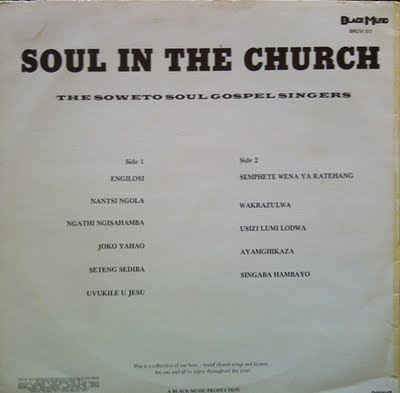 Do not confuse "The Soweto Soul Gospel Singers" (1975), with the currently popular Grammy award-wining Soweto Gospel Choir formed in 2002. 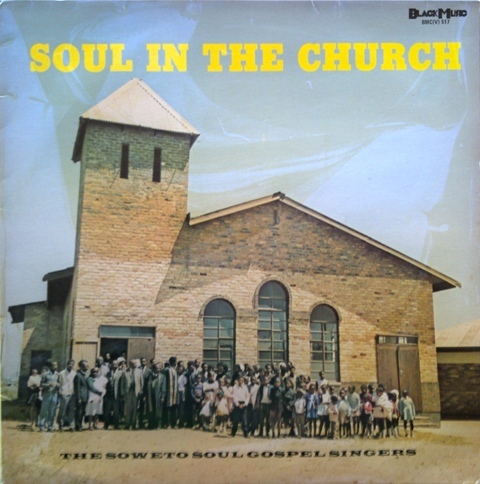 This here is the funky soul original testifying to catchy call and response rhythms backed by electric guitars, organ and drums - popular in the few black South African urban churches that could afford it during the dark days of apartheid, and more widely through records such as this one. This album was issued within the year building up to the June 16th, 1976 Soweto uprising - a turning point in which increasing numbers in the Churches and the clergy took on important transformative roles. South Africa has a strong choral and a-capella gospel tradition. Given the influence of black soul musicians from the U.S. on black South African urban music in the 1960s and 1970s I have always wondered why my vinyl digging escapades did not uncover much in the way of "soul" gospel. This recent find goes someway to filling that "gap" - of course, with its own South African adaptation and appropriation. With a reported 80 percent of South Africans being of the Christian faith, gospel is South Africa's biggest music market. Of all the posts on electricjive, the most visited page is The King's Messengers Quartet. Today's offering, now 36 years old, was written and recorded for local audiences in local languages - but clearly identifying with the U.S. Soul Gospel idiom. Babsy Mlangeni's singing here might be the closest South Africa got to our own version of the good Reverend Al Green. 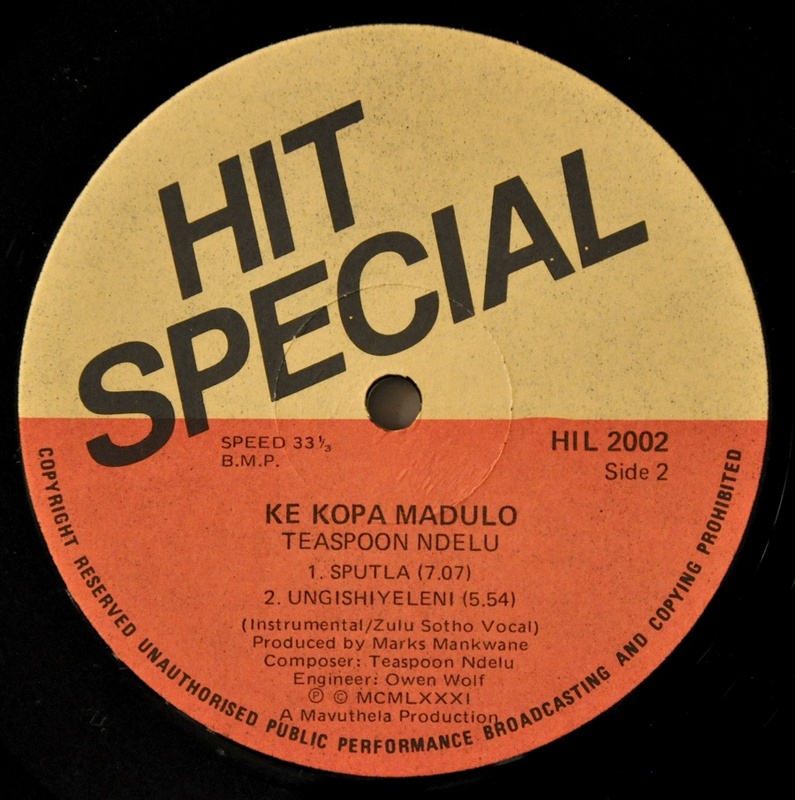 Producer Koloi Hendrik Lebona was one of the few consistently successful independent producers of the 1970s. He arranged most of the songs. Babsy Mlangeni wrote three of the songs, and sings in a lead role on the album. Look out for our next posting - number 150. Jazz lovers will not want to miss it. 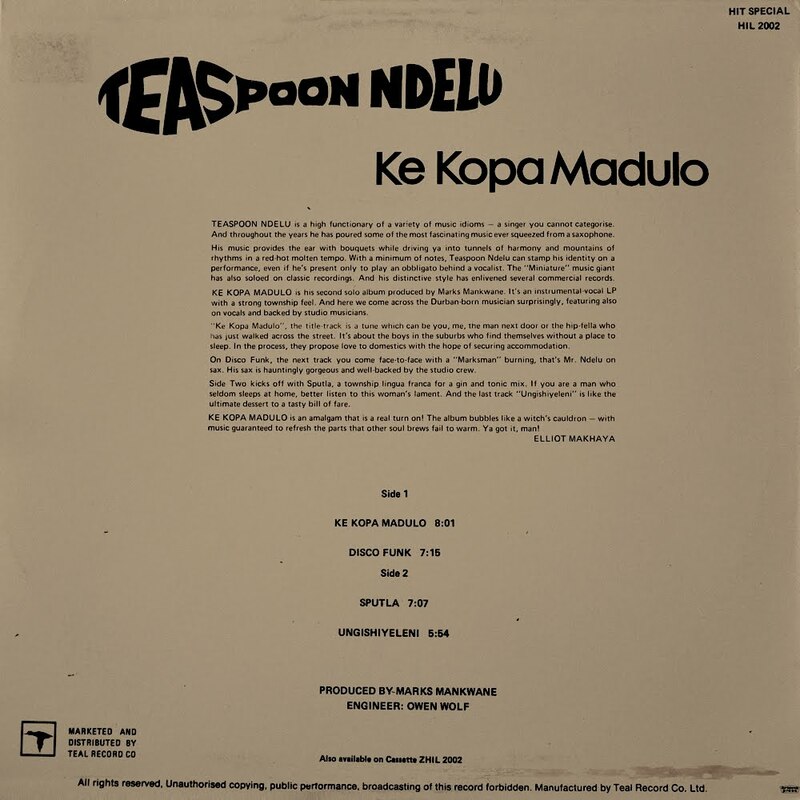 Today we're delving into a tasty mix of soul, funk and mbaqanga with the late saxophone legend Teaspoon Ndelu and his second solo album, Ke Kopa Madulo, produced by Marks Mankwane and released on the Hit Special label in 1981. 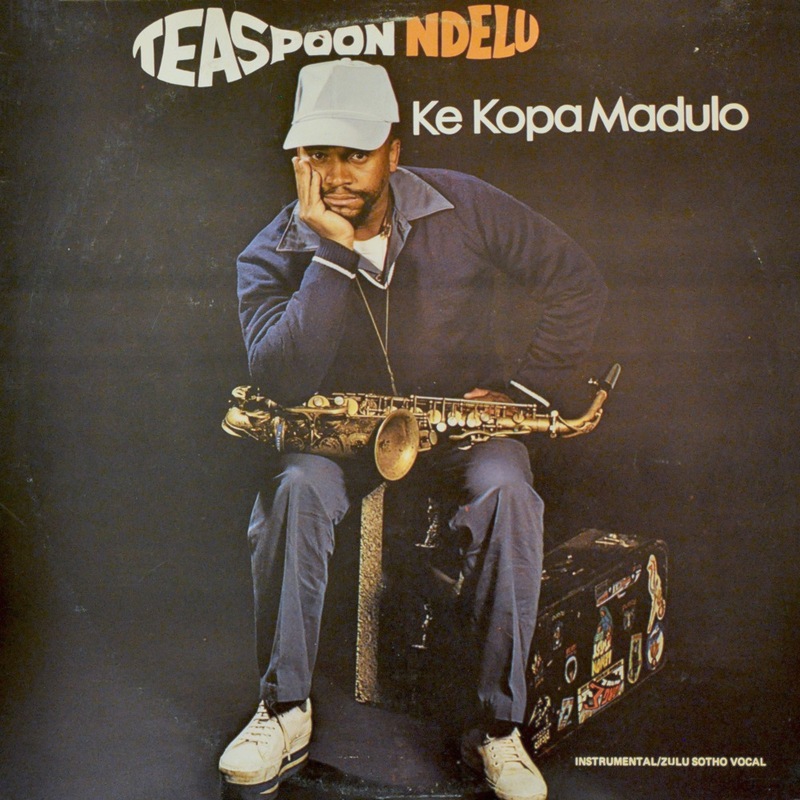 Ndelu was a veteran of the studio, particularly at Mavuthela, where his sweet sax harmonies often appeared on singles bearing names such as "Teaspoon and His 'T' Boys" or "Teaspoon and The Waves". He also collaborated with fellow sax jiver West Nkosi on many of the "mabone" singles of the early 1970s. In the words of the liner notes, written by The Sowetan's Elliot Makhaya: "Teaspoon Ndelu is a high functionary of music idioms... throughout the years he has poured some of the most fascinating music ever squeezed from a saxophone. His music provides the ear with bouquets while driving ya into tunnels of harmony and mountains of rhythms in a red-hot molten tempo. With a minimum of notes, Teaspoon Ndelu can stamp his identity on a performance, even if he's present only to play an obbligato behind a vocalist." Ndelu's own, talented skills were finally spotlighted with the release of his first solo albums in the early 1980s. This, the second of those albums, contains four songs and a rich collection of sounds. Teaspoon is backed by a talented team of studio musicians. To open the album, we are greeted first with a modern drum beat, before a sweet mbaqanga underscore makes a subdued entrance in the title track "Ke Kopa Madulo". A trio of alto saxes jumpstarts the song and before long, we are thrown calls and phrases from a plethora of singers, one of them Teaspoon himself. 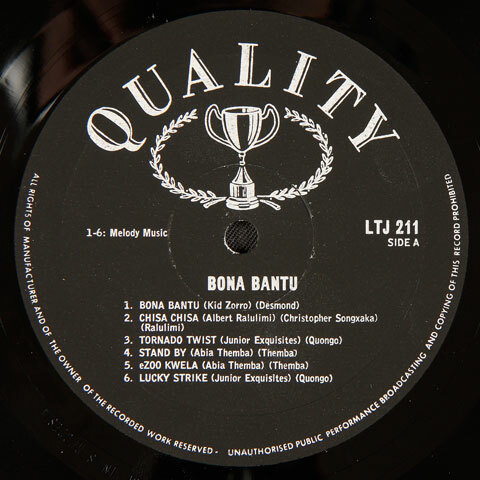 "Disco Funk", track two, is very much a product of the increasing Westernisation of South African music at the time - but gives one a great insight into how well versed Teaspoon and the other Mavuthela musicians were at playing vastly different styles of music. The talented Mr. Ndelu is backed by an uncredited studio team put together by producer Marks Mankwane. Though the members are uncredited, the band is almost certainly "The Beggers" (yes, with an "e"...). The Beggers was Mankwane's tight instrumental unit that backed his Mavuthela acts (Walter Dlamini, Mahotella Queens, etc.) from 1977 to 1983. The Beggers consisted of: Marks Mankwane (lead guitar), Michael Nyembe (lead/rhythm guitar), Mzwandile David (bass guitar), Michael Stoffel (drums), and Thamie Xongwana (organ) ... and the female vocals as heard on three of the four tracks of Ke Kopa Madulo are almost certainly then-regular members of Mankwane's Mahotella Queens. Well, why not - they were on hand! Ke Kopa Madulo... a truly tasty mix of music. Download and get funky - enjoy! Am currently traveling and so this very short post comes to you from a hotel room somewhere on the road near a lagoon. Bona Bantu, as the cover so wonderfully reveals, consists of a compilation of tracks previously released as 78 rpms on Trutone's Envee, Winner and Quality labels and probably range in date from around 1958 to roughly 1962. 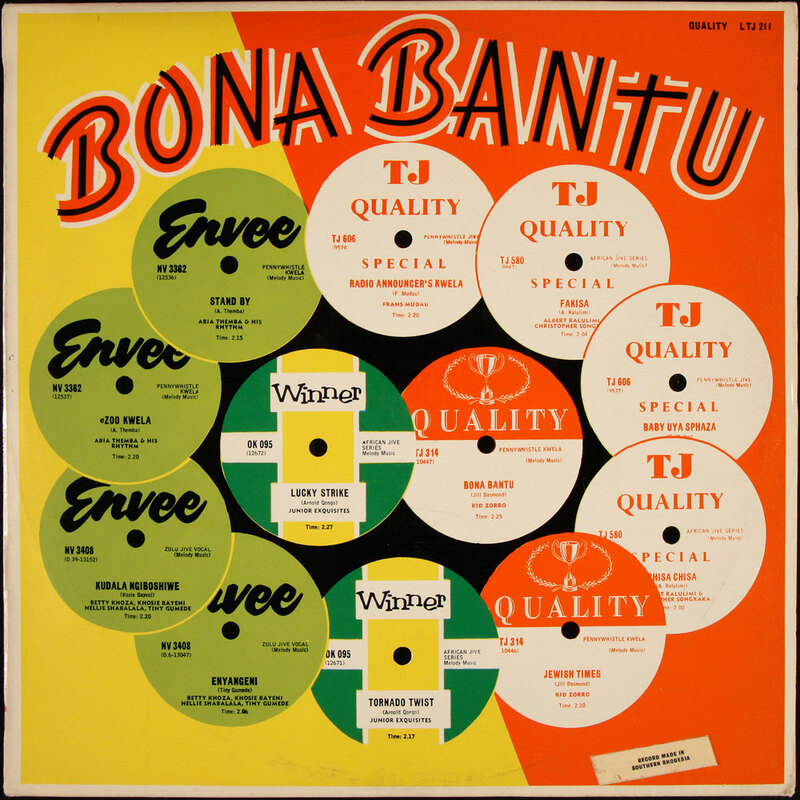 Notably the album was pressed in Southern Rhodesia (now Zimbabwe) but almost all tracks are by South African artists. 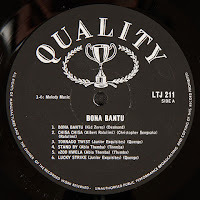 The vast majority of the tunes are kwela-based featuring amongst others Abia Themba as well as the Elite Swingsters' Albert Ralulimi and Christopher Songxaka. Betty Khoza also contributes two excellent Zulu vocal jives with Nellie Shabalala, Khosi Bayeni and Tiny Gumede. According to Rob Allingham, Khoza led this popular Durban-based all-female vocal quartet and subsequently most of the group's records were credited to her. Check out also the sounds effects department in action on Frans Mudau's Radio Announces Kwela. Short this is... please enjoy!